JCI Insight - Fat fibrosis: friend or foe? Fat fibrosis: friend or foe? Citation Information: JCI Insight. 2018;3(19):e122289. https://doi.org/10.1172/jci.insight.122289. At the simplest level, obesity is the manifestation of an imbalance between caloric intake and expenditure; however, the pathophysiological mechanisms that govern the development of obesity and associated complications are enormously complex. Fibrosis within the adipose tissue compartment is one such factor that may influence the development of obesity and/or obesity-related comorbidities. Furthermore, the functional consequences of adipose tissue fibrosis are a matter of considerable debate, with evidence that fibrosis serves both adaptive and maladaptive roles. Tissue fibrosis itself is incompletely understood, and multiple cellular and molecular pathways are involved in the development, maintenance, and resolution of the fibrotic state. Within the context of obesity, fibrosis influences molecular and cellular events that relate to adipocytes, inflammatory cells, inflammatory mediators, and supporting adipose stromal tissue. In this Review, we explore what is known about the interplay between the development of adipose tissue fibrosis and obesity, with a view toward future investigative and therapeutic avenues. Schematic representation of the cellular events associated with increased collagen synthesis in obesity. 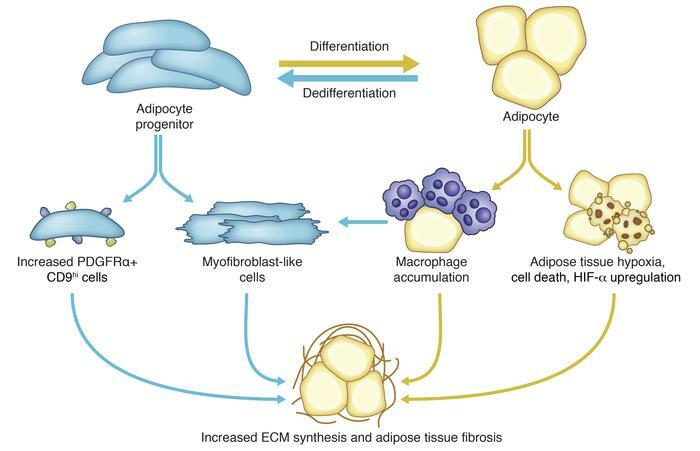 The interplay among adipose tissue expansion, adipocyte differentiation, and adipose tissue fibrosis is marked by (a) dedifferentiation of adipocytes and increased production of fibrogenic progenitor cells, which lead to excess collagen synthesis in obese adipose tissue, and (b) growth of differentiated adipocytes during obesity by hypertrophy, which leads to inflammation and hypoxia, resulting in increased ECM production. Illustrated by Rachel Davidowitz.